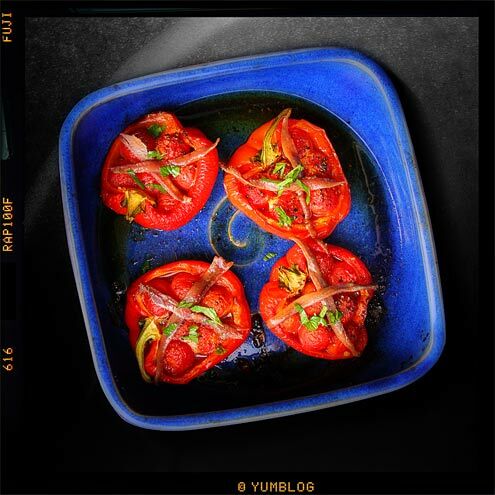 …and talking of Simon Hopkinson, this week’s episode of TGC featured two vegetable dishes which looked so simple and tasty we knew we had to try them out here at Yumblog Towers. 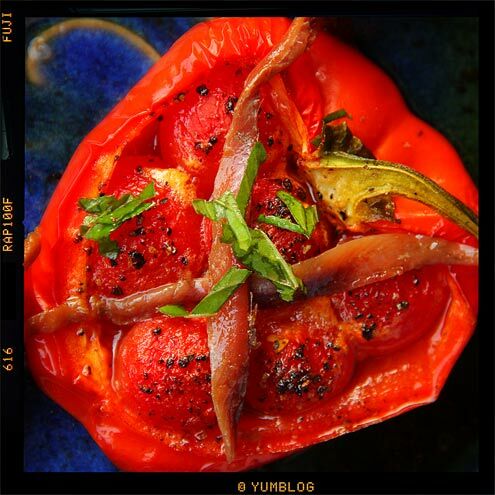 The first was this roasted pepper and tomato dish which if you cook nothing else between now and the world’s end (August 2012), cook this. It is astoundingly delicious. In the spirit of TGC and because there seems little point in writing up something that is so current, click on this link or scan the ‘Quick Response’ code below for the full list of ingredients and recipe. We stuck pretty close to the published recipe, the only difference being the use of cherry tomatoes rather than the plums. Drink: Tuesday night is temperance night. Entertainment: The beginning of the 5th season of ‘Ideal’. Utter joy. The soundtrack is excellent too, if you manage to find a copy. So, I switched a few things (tinned as opposed to fresh tomatoes, dried basil before it went in the oven, and capers on top afterwards instead of anchovies). But if you can get over all the deviation, then this turned out really well. Thanks for sharing!